This weekend was an oil painting marathon. Six hours in two days. I really enjoy oil, the painting seems to emerge from the painting panel. When the color and shape are right, it looks “real”. So this is what happened, Carol and I are still put the “first sitting” on. 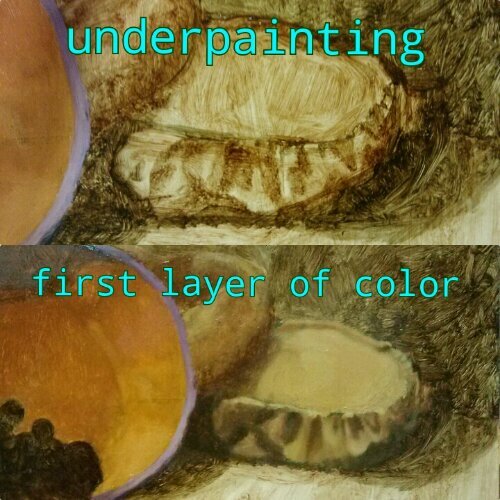 That is the first layer of color. Using fine bristle brushes, since they don’t come to a point like sable, use a smaller size. I like filberts, has a point and a slightly flat side of tip, making the brush more versital. 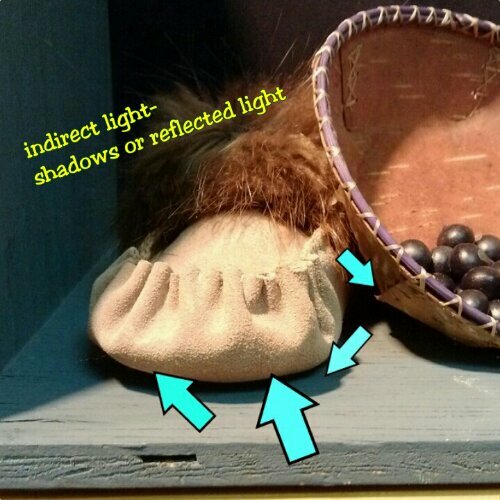 Now the hard part, look closely at moccasin(your object may be different). There are cool and warm tones on everything. 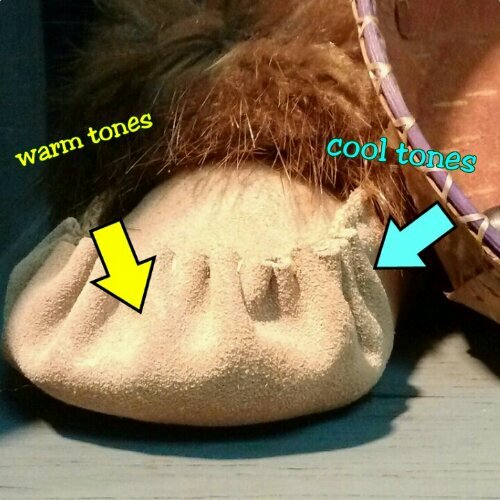 Warm tones are the tones that are in the Direct light, Cool tones are in Indirect light. Wow! That really made sense. 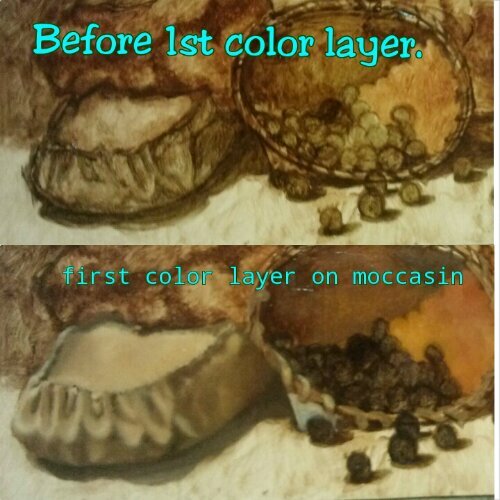 (just kidding) Here’s how I sort it out, top of moc is mostly warm tones. 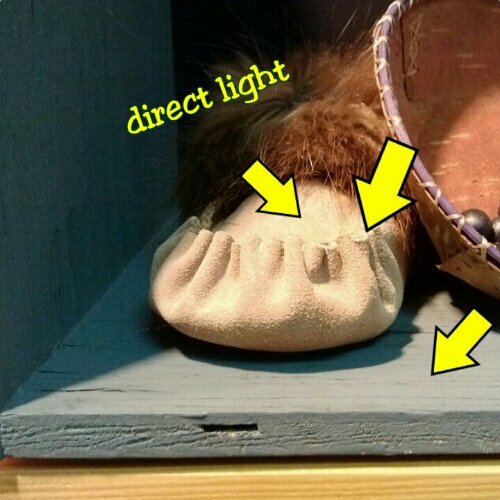 The side of moc are a mix depending where the light come from. Now back to looking for where the shapes of shadows are and paint on your board. I am laughing, because this little task is the hardest thing to figure out. How to tune your eye, brain and intuition about painting to make this happen. 3 years in and I still very much feel like a novice. Now to color! Then mix the color as close as you can to the mid-range local color. The tan color of the suede moc. Not the highlights or shadow colors. Here’s where it gets tricky. Color mixing is practice and color chemistry. It is about knowing what happens when you mix paint colors, there is no formula. Back to suede color, it looks kind of yellowish, so mostly yellow ochre, with a little titanium yellow, add a touch of “red” and burnt sienna. I work in two spots of paint, warm suede and cool suede piles. On the cooler suede I add crimson (this is a super strong color, go lightly), raw umber (to darken) and titanium yellow (to lighten). The add a touch of medium to make it flow nice. Now you can see why it takes six hours and I only have half of one moc done. Add in the drawing mistakes that were corrected. Most frustration comes back to incorrect drawing, at least I can see it earlier this time. We work very hard this weekend. Have a Blessed Sunday! Wednesday! One week later! Argh! Interesting to follow the process! The picture is going to be awesome.